SLATER, Iowa -- One little girl's mock letter from her school is creating lots of Internet buzz after her dad shared it with Reddit users around the world, ABC News reports. "It's amazing," dad Terry Grimard of Slater, Iowa told ABC News. "When I posted it, I didn't think anything of it. When I looked last night, I said 'Wow, it's kind of blown up.'" Grimard, 51, said his daughter Cara, 7, had been off from school for the holidays since Dec. 22, and returned to her second grade class at Ballard West Elementary School on Monday. "I kept teasing her because I was off from work also," Grimard said. "I was saying 'Guess what Monday is? I have to go back to work and you have to go back to school. She jokes around like she doesn't like school, but she does, she enjoys it." Knowing her vacation time was near its end, Grimard, a dad of two, said his daughter wrote a mock letter from her school and told him it came in the mail. 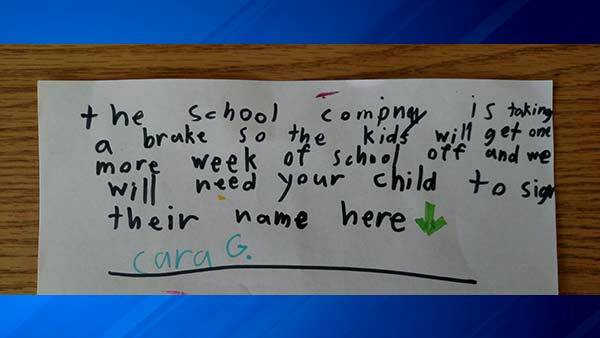 It read: "The school company is taking a brake [sic] so the kids will get one more week of school off and will [sic] need your child to sign their name here." In blue marker, she signed her name: "Cara G."
Grimard posted a photo of the letter to Reddit on Sunday, where it received 2.5 million views. "She kind of had a little sly grin," Grimard said. "She wasn't being serious, she knew I wouldn't buy it. It was just really cute and she's this funny character in general. Grimard said after seeing how popular Cara's note had risen on the Internet, he and his wife decided to keep it for memories.